On Monday, EJ and I went to the book sale at the library. We can’t resist book sales. We ended up buying another couple dozen books for $3.20. As we arrived at the library, we saw an older man on foot pull a good-sized wagon and park on the library lawn. EJ talked to him a bit and discovered that he is walking across America. Usually people who are walking or biking across the country have some reason for doing so–a personal challenge, to experience the country up close, or to raise awareness for a cause. EJ said this man didn’t say why he was making this journey. He just said that he is looking for a place to rent over the winter before continuing on his way in the Spring. I thought it was really interesting. I often think that there are interesting people and events happening all the time. Some of them are big and some are small. Today EJ and I went to the grocery store, and we saw a woman with a dog on a leash at the deli counter inside the store. I always enjoy encountering cats or dogs in a store, but usually they are not allowed in grocery stores unless they are service dogs. Usually service dogs have vests on indicating that they are working. This dog had nothing of the sort. We wondered why there was a dog in the store. Did the woman sneak the dog in? Did she have permission from the store? And, if so, what was the reason? We will probably never know, but it’s interesting to speculate. I have been caring for my neighbor’s little dog while she at a wedding in another state. I walk the two blocks to her house twice a day–once in the morning and once in the evening–to let the dog out and feed him. I think caring for an animal involves more than just providing for his physical needs. It also involves giving him love and attention. 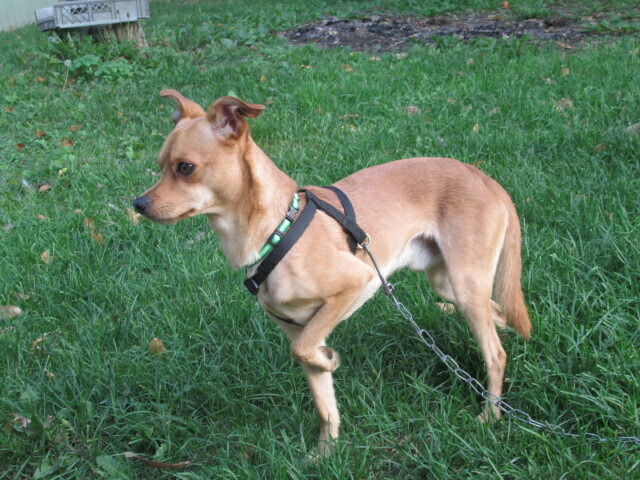 However Keno is very timid and skittish and for four days he kept out of my reach, running away when I got close to him. I kept speaking gently to him, and when he was ready to come back inside, I would gently pull on his chain to draw him close and pet him. He always ran away as soon as I got him unchained and in the house. 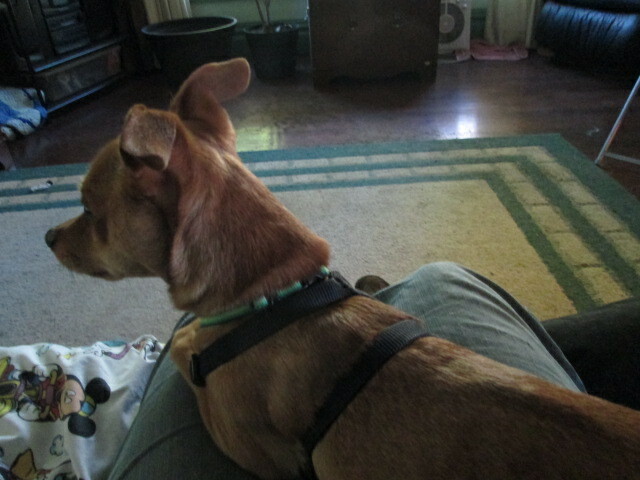 Keno sitting on my lap. Monday morning, for the first time, he came close to me on his own. I sat down on the couch and he pressed his little body against my leg so I could pet him. That night when I had provided for his physical needs, I sat on the couch again and he ran up to me and jump into my lap. I held him for about 20 minutes, talking to him and stroking him. Now we are buddies. He watches for me at the window and greets me with excitement when I come into the house. As soon as I finish caring for him and sit in the big chair, he leaps into my lap and cuddles with me. Keno reminds me of little fawn. He is very small and delicate, with doe-like eyes. His face is very expressive. He studies my face intently, as if he is trying to see what will please me. When I talked to him, his ears perk up. He is very adorable. I’m always somewhat sorry to leave him because I think he must be lonely. I spend as much time as I can with him. His owner will return in a few days. Today was a beautiful sunny day. This afternoon I went outside and harvested my sunflowers.